80 per cent of readers never make it past the headlines of your posts. Newspapers have worked on this basis for centuries. Their sub-editors, who write the headlines, can persuade millions to buy their paper every day on the strength of five or six powerfully crafted words. The competition is even more fierce on line. Whichever sector you’re in there are a gazillion compelling blog posts, status updates and tweets competing for your reader’s attention as they scroll through their newsfeed. What’s going to make them stop scrolling and read your post? A compelling, clickable, irresistible headline. That’s the only job of a headline, or blog title – to get people to click on it and read the full article. Without it all the hard work you’ve put into crafting a value filled post could go to waste. Not only will content with well-written headlines be clicked on more it will also be shared more on social media. I’m sure I’m not the only one who often shares content, from sources I know are reliable, on the strength of the headline alone. So headlines deserve your time and energy. But how do you write headlines your audience can’t resist clicking on? Don’t stress out about what your headline is going to be until you’ve written your post or article. Sometimes you’ll have a killer headline in mind from the start, but usually if you written a headline one beforehand – you’ll usually change it afterwards. I always do. Start with a working title that gives you a clear parameter to work within. For instance the working title for this post was ‘How to write headlines’. Once you’ve written the post you’ll usually have a clearer idea of the main hook that’s going to make your audience sit up and take notice. That’s where your killer headline will come from. Make a compelling and explicit promise that’s impossible for your reader to refuse. As I touched on earlier every one of your readers is being bombarded with information on a daily basis. You need to give them a really good, clear reason to stop and read what you’ve written. So take a look at the content of your post and think about from your reader’s point of view – why should they click on your article? Why should invest their time in what you’ve got to say? Your headline has to make it clear what your reader is going to gain from reading your post. So once you have a compelling promise, an element of intrigue will add an extra dose of clickability. ‘Enhance everything you write: lose the adjectives’. That piques your interest more now doesn’t it? Why? Because you think you’re being let in on insider information and you’re left wondering what it is. You’ve seen this everywhere I’m sure. Quite a few of my post use numbers in the headlines. And for good reason. Headlines that use numbers tend to generate 73% more social shares and engagement, than headlines that don’t. This type of headline is great for list posts and step by step how to guides, but it can lose it’s power if you use the same formula every time, so mix up this style with non-numbered headlines as well. Maximise the emotional pull of your headlines by speaking directly to your audience. Use the words ‘you’ or ‘your’ to make the immediate connection that spells out why your article is of benefit to them specifically. This is a great tactic to remember in everything you write, not just headlines. Even on your About page, the words ‘you’ and ‘your’ should dominate not ‘I’, ‘we’ or ‘our’. It’s never about you, it’s always about your audience and how you’re benefiting them. So make it clear that you’re talking to them. For instance the obvious title for my last post would was, ‘5 books that changed my mindset,’ but I flipped it around to, ‘5 books that will change YOUR mindset’ – far more compelling because it speaks directly to each and every reader. Keep headlines short and snappy – ideally six to eight words. To do that you have to focus on the one thing – your compelling promise – that’s going to jump out and make your readers say ‘Yes’ I want that! Incidentally shorter is also better for sharing on Twitter, because it leaves room for a shortlink and your @mention, and for showing up in search results. Google shows approximately 70 characters before the title is truncated. So when you’ve written your headlines, see if you can cut out some words to add punch and keep it shareable. Certain words capture attention, generate curiousity or have an emotional kick. Use them. For more power word inspiration check out this post on Boost Your Blog Traffic. When you come across a headline that you couldn’t resist clicking on, save it. Clip it to Evernote, or just copy and paste the headline into a Google doc. Do this regularly and you’ll have a library of headline examples at your disposal to refer to for inspiration when you’re stuck. Also check sites like Buzzfeed and Upworthy for headline ideas. Their content might not be your thing but their headlines work! Try out Portent’s content idea generator. It takes your keyword and creates a few – not always usable – headlines options for you. When you’re stuck anything is worth a try! True facts about Justin Bieber’s love of headlines! So there you have, my quick and dirty guide to headline writing. Try it out and see if it helps you write headlines your audience just can’t help clicking on. It’s worth the effort, I promise. 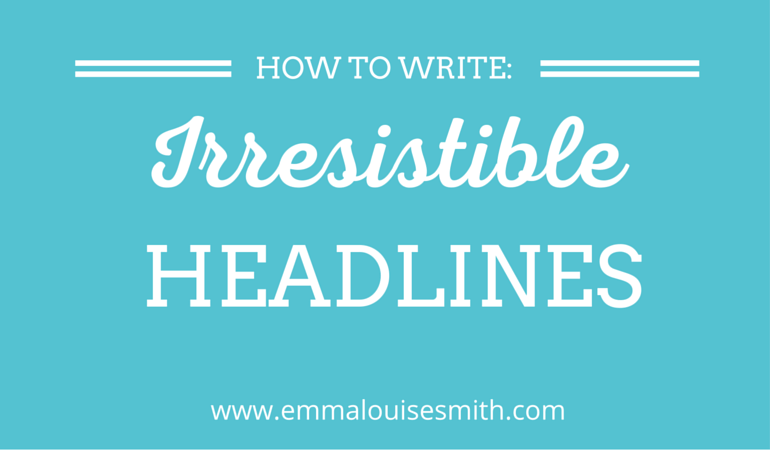 Do you have any other headline writing tips you’d like to share? What type of headlines work best for you? Thanks Brittany – I hadn’t seen Coschedule’s tool and it’s great! Great tips! Definitely keeping this handy for my next blog post writing session! Thanks Kathryn, very glad you found it helpful! Wonderful post. But I think using numbers is getting too common and too boring. But we can combine it with some other tactic to make it more interesting. Wonderful post. Thanks for reading and commenting! I don’t think numbers will ever get boring, but you’re right, as I’ve said it needs to be mixed in with other kinds of headlines, otherwise yes, it gets a bit samey and variety is always more interesting!